Satisfy your appetite for lunch or dinner at Hofgarten, a restaurant which specializes in Mediterranean cuisine, or stay in and take advantage of the room service (during limited hours). Wrap up your day with a drink at the bar/lounge. Buffet breakfasts are available daily from 6:30 AM to 10 AM for a fee. With a stay at Hotel Ascot-Bristol in Potsdam, you'll be within a 15-minute drive of Babelsberg Film Park and Sanssouci Palace. This 4-star hotel is 10.4 mi (16.8 km) from Free University of Berlin and 12.9 mi (20.7 km) from CityCube Berlin. Enjoy international cuisine at Templiners, one of the hotel's 2 restaurants, or stay in and take advantage of the room service (during limited hours). Snacks are also available at the coffee shop/café. Quench your thirst with your favorite drink at the bar/lounge. A complimentary buffet breakfast is served daily from 6:30 AM to 10 AM. Make yourself at home in one of the 137 guestrooms featuring minibars and flat-screen televisions. Complimentary wireless Internet access keeps you connected, and satellite programming is available for your entertainment. Private bathrooms with showers feature complimentary toiletries and hair dryers. Conveniences include phones, as well as desks and complimentary bottled water. With a stay at Dorint Sanssouci Berlin/Potsdam, you'll be centrally located in Potsdam, a 3-minute drive from Sanssouci Palace and 14 minutes from Babelsberg Film Park. This 4.5-star hotel is 14.5 mi (23.4 km) from Waldbuhne and 14.8 mi (23.9 km) from Olympic Stadium. Enjoy recreation amenities such as bicycles to rent or take in the view from a terrace. This hotel also features complimentary wireless Internet access, wedding services, and complimentary use of a nearby fitness facility. Set amid the Pirschheide lakes and woodlands, this 4-star congress hotel is located on the shores of Lake Templiner See, just to the west of Potsdam's town centre. WiFi is provided free of charge. The Kongresshotel Potsdam am Templiner See offers spacious and well-equipped rooms in 3 futuristic buildings, named after airships originally built in this area. Some rooms are equipped with air conditioning. 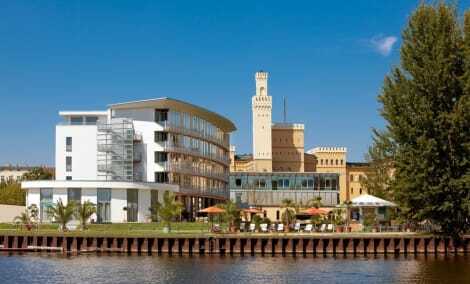 The Kongresshotel Potsdam is an ideal venue for business events. The unique glass architecture and natural daylight provide ideal conditions for creative thinking. Dine in the hotel's à la carte Lemon restaurant, or in the Zeppelin theme restaurant. Enjoy a drink in the stylish Blue Sky Bar & Lounge, or in the open-air bar with a view of the lake. The excellent public transport connections from the Kongresshotel am Templiner See mean that you are just 10 minutes from the centre of Potsdam, and 30 minutes from Berlin. Pamper yourself with a visit to the spa, which offers massages and body treatments. You're sure to appreciate the recreational amenities, including a health club, an outdoor pool, and an indoor pool. Additional features at this hotel include complimentary wireless Internet access, gift shops/newsstands, and wedding services. Located in Potsdam (Wildpark), Romantik Hotel Bayrisches Haus is within a 10-minute drive of Charlottenhof Palace and University of Potsdam. This 4-star hotel is 3.5 mi (5.6 km) from New Palace and 3.9 mi (6.3 km) from Sanssouci Park. 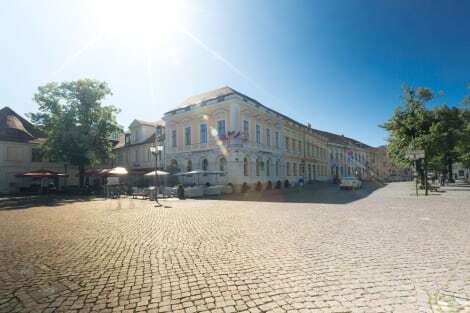 Located in Potsdam (Babelsberg Nord), Seminaris Avendi Hotel Potsdam is within a 15-minute drive of Babelsberg Castle and Park Babelsberg. This 4-star hotel is 12.1 mi (19.5 km) from CityCube Berlin and 12.3 mi (19.7 km) from Messe Berlin. lastminute.com has a fantastic range of hotels in Potsdam, with everything from cheap hotels to luxurious five star accommodation available. We like to live up to our last minute name so remember you can book any one of our excellent Potsdam hotels up until midnight and stay the same night.